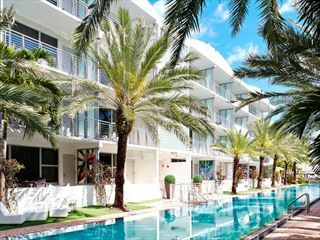 This lovely hotel is located along Miami's vibrant South Beach, looking out onto more than 200 feet of pristine white sands. Chez Gaston Restaurant – Enjoy classic American cuisine for breakfast, lunch and dinner, all the while enjoying lovely Miami Beach views. Open 7am-11pm. Lobby Lounge - An inviting lounge offering delightful pre-dinner cocktails. Espresso Gelato Bar - Enjoy a quick coffee or breakfast on the go, before heading back here at lunchtime for a panini or Italian gelato. Sunset Bar & Pool Lounge - Situated on the 7th floor, this bar offers sensational views of the sunset. Beachside Pool Cocktail Bar - Sip on a refreshing cocktail at this cabana style bar. Renovations are currently being carried out to the poolside bar. During this time there will be a partition dividing the pool deck and the pool bar. Work is scheduled between 9:00am and 5:00pm, Monday - Friday. Guests will continue to have access to the pool facilities on the 7th floor. The property has gone to great lengths to keep disruption to a minimum, and does not expect for guests overall vacation experience to be affected. Prices correct as at 6pm on 22 Apr 2019. Please call for final price. Prices are per person based on 2 adults sharing a room. Other durations available - call for quote. Prices include flight and accommodation as stated below and car hire including Dollar rent-a-car's 'fully inclusive' insurance for the full duration. For more car hire and transfer options please ask your travel expert. Peak Season surchage applies on the following dates: 29-31Aug14, 01-08Dec14, 30Dec14-4Jan15, 13-17Feb15, 20-23Feb15, 14-23Mar15, 23-26May15, 4-7Sep15, 1-8Dec15 and 30Dec15-04Jan16 Please ask your travel advisor for more details. Based in the north of Miami Beach, Grand Beach Hotel Surfside, this brand new hotel is the ideal base for a wonderfully relaxed holiday by the sand and sea. Minutes from both the beach and the shops it is perfectly located. 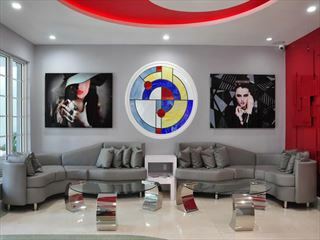 Set in Miami’s Art Deco district, the Fashion Boutique Hotel is a striking building with a stylish décor and fantastic location. Just a stone’s throw from the gorgeous beach, great shopping centres and amazing dining.